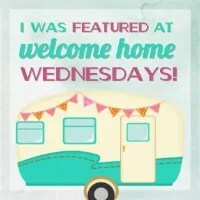 Welcome to Welcome Home Wednesdays #35!!! How was your week? We had a busy weekend with tons of spring basketball and we enjoyed some time with friends. The rain returned, but not for long. The sun is suppose to be back for a gorgeous weekend, yay! Hopefully I can get all the stuff on my to-do list done so that I can enjoy it! Thanks for coming by, Katrin! Have a wonderful day! Thanks for coming by, Stacey! I love seeing all the inspiration and meeting new bloggers, too! Thanks for the invite! Happy Wednesday Erin! Hope you are getting some of this beautiful spring weather today! Great party! Great guests! Great hostesses! Thanks and I’ll see you next week. Thanks for linking up, Lynn! Our weather is a bit wet, but sun is coming for the weekend, so I’m happy 🙂 Have a great week. I appreciate you stopping by and commenting! Thanks Erin for the party. My new post is not ready so I added an old post. I think it is fine. Of course! Just glad you’re here, Sadhna! Have a wonderful week! Thank you for the wonderful opportunity to share my posts and those of your awesome readers! I hope you will join me at #WonderfulWednesday and #ThursdayFavoriteThings! Have a great week. Don’t forget to comment your link #’s so I can be sure to visit. Thanks for coming by and thanks for being so generous with your shares! Thank you so much for linking up every week and sharing your yummy recipes and projects! Thanks for a lovely party! Happy Wednesday!!! Hi Erin! Thanks to you and the ladies for hosting! Hope you’re having a great Wednesday and a happy week! So nice to see you here, Cindy! Hope you’re having a wonderful week! Thanks for hosting. Sure do love this party. I have shared your party in the link up party directory. Thanks for coming by! Love seeing you! I’m so glad I found this party! I love doing these!Following all hosts on Pinterest and Instag. thanks for this! Yeah! So glad you’re here, Jody! We hope to see you next week for another awesome party!